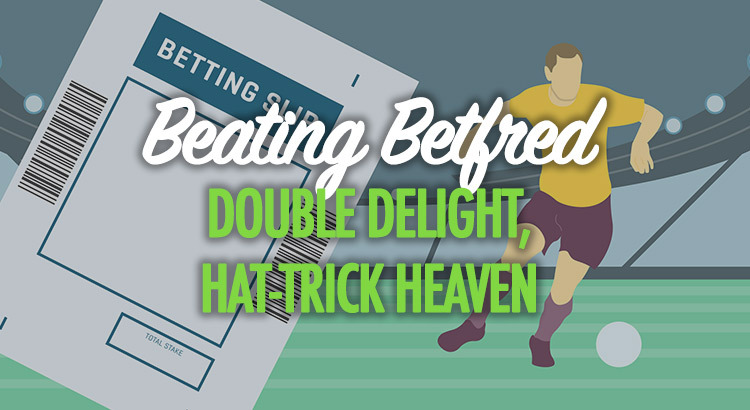 ‘Double delight, hat-trick heaven’, or ‘DDHH’ as it’s more commonly referred to in the world of ‘no-risk’ matched betting, is a really exciting offer that gives us plenty of expected value (EV) and potential long-term profits. In this guide we’re going to be looking at how to profit from the DDHH offer and give you a variety of tips for making the most success from it. If you are not familiar with the basics of the offer, it’s relatively simple. It is a little different to many other offers because it is placed on the ‘First Goalscorer’ market, whereas typically we bet on a team or horse to win. The strategy is to place a first goalscorer bet on a designated DDHH match on Betfred or Totesport, who both run the promotion, and lay it via the exchange. You then want your chosen player to score first. That part is pretty obvious, right? However, when this happens, you won’t have made any profit yet. If they then go on to score a second goal, you will have a significant amount of profit. If they score a hat-trick…it’s party time. You’ll be paid out at treble the odds; it’s double for just the two goals. Whilst the profits can be extremely rewarding, this offer isn’t for total newbies and also should be avoided if your bankroll or mentality can’t handle a bit of variance. Typically, you will see medium-to-long-term losing streaks with this offer, where you will generally lose at least a few pounds in qualifying losses. The first and most important step, like with all matched betting offers, is to find a good odds match. However, what’s considered a good odds match for DDHH is much different to what is appropriate for the vast majority of other offers. Anything up to a 20% qualifying loss is typically regarded as +EV (expected to be profitable long-term). This means on a £20 stake, you’d be expected to be spending up to £4 in qualifying losses. When you’re betting bigger, this obviously increases to a £20 qualifying loss on a £100 stake. As we covered above, this isn’t the type of offer for those that aren’t comfortable with sustaining streaks of consistent losses. The reason we’re comfortable taking such large qualifying losses for this offer is because the payout is so large and the relative likelihood of it happening is still quite high, especially when compared to other lucrative payout offers like 2up. It’s important to keep the smaller profit offers – even those worth only £1 or £2 – ticking over as these help massively to reduce the blow of a failed DDHH attempt. An example odds match of the maximum loss you should be taking is odds of 4.5 to back and 5.5 to lay. This is a 19.5% qualifying loss when paying 2% commission. When a good odds match is available, you need to be ready to take it. Betfred (and Totesport) are known to cut the odds if they’re ever +EV, so you need to be one of the lucky bettors to get on the higher price whenever possible. Hope for a good odds match and get on it. However, there a few additional tips and considerations that can help you to be more successful with this offer. I’ve outlined them below. This is an obvious one and isn’t going to go blowing any minds for its ingenuity. But it’s an important one. There are only a set amount of games that are selected for this offer on a daily and weekly basis. Be aware of them and be alert. The line-ups are announced an hour before kick-off, and this can be your opportunity to get a great odds match. There are regularly times when the lay odds on a specific striker will come flying in. This can happen when teams with two-striker formations line-up with only one, or when each team has one main striker – but one gets benched or has a last-minute injury. If you’re ready an hour before kick-off, you’re likely to see the most long-term success with this offer. There are also times where you can get a good match a good number of hours, or even days, before the match kicks-off. Be aware, but be sensible. If you live or work in a reasonable proximity to a Betfred store, use it. This is because the odds are cut much slower in store than they are online. If you see a good odds match on their website – say at 5.0/5.5 – but they get cut before you can get your bet accepted, rush to your local bookie. This might seem like a lot of effort, but the EV is significant (assuming it doesn’t cost you a lot in petrol and parking). If you’re committed to making the most profit you can, this is something you need to consider doing. Even if the odds don’t get cut, visiting the store can allow you to increase your total stake on the bet without risking your account health as much. It might be worth using the ‘underlay’ feature on the advanced mode of the matched betting calculator. The EV will be ever-so-slightly increased as you won’t be paying as much in commission (assuming you’re not on a 0% commission offer, that is). It also means that if your player scores first but does not score again, you won’t have the compounded annoyance of both a large qualifying loss and a hit to your exchange balance. By underlaying, you’ll have no qualifying loss if your player scores first – but you won’t have a profit unless they go on to score again. Sometimes, bettors get tempted to take larger qualifying losses for players more likely to score two or three goals. For example, Messi could be an obvious one to turn some heads at an odds match of something like 3.5/4.6 – a 25% qualifying loss. After all, it’s Lionel Messi. Of course he’s more likely to score first and score many. However, the important thing to factor in here is that his likelihood of scoring first (and scoring many) is already weighed into his odds. His odds are lower, meaning you get a lower payout should the inevitable happen. This is why we calculate qualifying losses as a percentage and not as a set figure, because it helps to eliminate this issue. It is actually more beneficial to calculate based on a percentage of your potential winnings, rather than a percentage of your stake, but the latter is simply far more efficient and more simple for most people, too.